Admission $10 online or at the door. *Price of admission includes free birthday treats AND a special birthday zine. 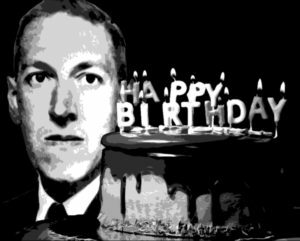 The stars are right for another night of dark birthday magic as we celebrate (for the sixth year in a row) the birth of the granddaddy of cosmic horror: H.P. Lovecraft! We’re honoring the spirit of our favorite grim New Englander with a night of music, poetry, dramatic readings, performance art, comedy, and magick inspired by his dread works. Hosted by Crafty The Cosmic Horror Clown, we’re throwing a birthday party full of balloons and mind-shattering sights and sounds! There’ll be fun party games like Pin The Tail On The Shoggoth and Duck Duck Mi-Go! And even a few rounds of Mythos Trivia, where audience members will get a chance to take home some sweet, sweet prizes! -ERNESTO MONCADA FROM ARCANA COLLECTIVE! -AND MORE TO BE ANNOUNCED! Please note: The producers of this show are not responsible for any loss of life, limb, or sanity experienced while watching this show. Nor are they responsible for any temporal or extra-dimensional dislocation/relocation you may be subjected to. You’ve been warned!